Let’s talk a little bit about pumpkin, shall we? Pumpkin is good. It’s good in pie, it’s good in savory dishes, it’s good in soups, it’s even good in coffee as Starbucks would have you believe. Carving pumpkins is awesome, too. How about pumpkin in lasagna? No, that’s not a typo. “But wait,” you say, “lasagna is supposed to have meat and tomatoes and lots of cheese! How can you fit pumpkin into all that?” Well, dear reader, I encourage you to branch out from your usual ideas of lasagna, cause this stuff is damn good. 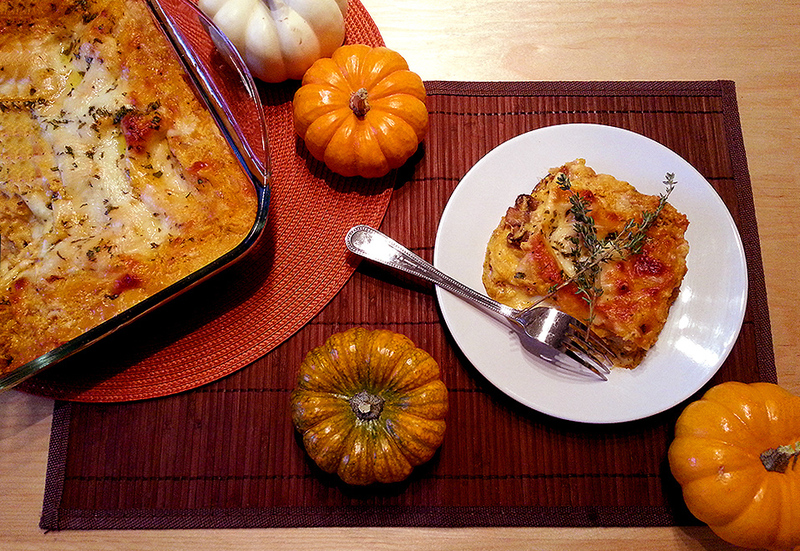 I’ve had various recipes for pumpkin lasagna kicking around my head for a few years now. I’ve made pumpkin lasagna a handful of times, and each time it’d come out different because I didn’t tend to write down the ingredients that I used. I just threw in whatever sounded good and Fall-like, and all was well. I got to thinking recently (since the calendar has turned to November and all things pumpkin-related) that I wanted to create my definitive, best-ever recipe for pumpkin lasagna, one that I’ll come back to time and time again because I just love it so much. This is it, y’all. The best pumpkin lasagna that I’ve ever made. Please try it, it’s savory and creamy with a hearty mushroom filling and, well, perfect! Begin by spraying an 8×8 inch baking dish with cooking spray and set it aside, and preheat your oven to 350. To clean your leeks, chop off the bottom root portion, and chop off the tough darkest green part of the tops. Slice the leeks in half lengthwise and separate the leaves from one another and run them under water. Lots of grit and dirt can hide between the layers, so rinse them well! Pat them dry with paper towels and chop into small pieces. Over medium-high heat, sautée the mushrooms, garlic, leeks, salt, pepper and thyme in the olive oil until it’s all well-browned and smelling awesome, maybe 8-10 minutes (feel free to use 1/2 – 3/4 tsp pepper if you don’t like pepper as much as I do!). Let it cook longer if you want your mushrooms more browned. With the heat still on the pan, pour in your white wine and let it bubble for a few seconds, stirring the mushroom mixture around. Remove the pan from the heat. In a medium sized bowl, mix the ricotta, pumpkin, salt, pepper, and nutmeg until well blended. Boom, your filling’s done! It’s assembly time for this awesome lasagna! In the bottom of your baking dish, spread a little of the alfredo sauce to coat the bottom. Place two lasagna noodles over the sauce, overlapping slightly if you have to, and top those noodles with 1/3rd of the alfredo sauce, half the mushroom mixture, 1/3rd of the ricotta mixture, followed by 1/3rd of both cheeses. Repeat with two more noodles, 1/3 more sauce, the other half of the mushroom mixture, 1/3rd more of the ricotta, and another 1/3rd of the cheeses. The final layer will be two more noodles, the last of the alfredo, the last of the ricotta, and the last of the cheese, followed by a sprinkling of fresh chopped parsley. Slide this whole pan, uncovered, into your preheated 350 degree oven. Bake the lasagna for 50 minutes. The edges should be golden brown and bubbly, and the cheese on top should be melty but should not have taken on too much color. Let the lasagna sit at room temperature for 10-15 minutes before cutting into it to serve, cause it’ll be waaaaaay too hot otherwise. When I had a piece of this lasagna, I had to restrain myself from having more than one serving cause if I was hungry enough, I think I could have eaten the whole pan! It’s my new favorite Fall recipe, smooth and mellow and creamy. it’d be perfect as a vegetarian main course this Thanksgiving! Paired with some crusty bread, a big green salad and a glass of wine (and maybe some pumpkin pie for dessert), it’d be fantastic as a new twist to your holiday table! YUM! But that sounds like an awful lot of ingredients to cram into an 8 X 8 pan… usually I need an 8.5 X 11 to feed my horde… would you just double everything to make it that size? (I just cooked and froze 62 cups of fresh pumpkin puree, so I’m always interested in new ways to use pumpkin!) Thanks for posting such an intriguing recipe! Previous Previous post: bring back the ‘stache!